Andreas Renschler, left, is pictured with Daimler CEO Dieter Zetsche. BERLIN (Reuters) -- Daimler is grappling with the surprise resignation of executive board member Andreas Renschler, who had been rumored as a potential candidate to succeed CEO Dieter Zetsche. 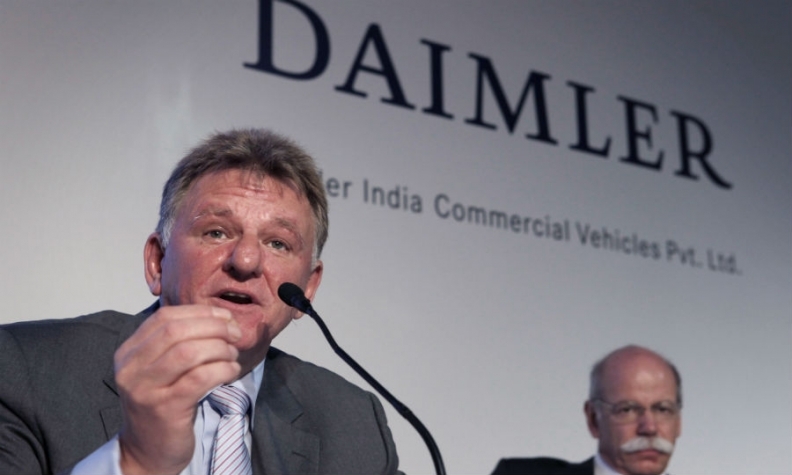 Renschler, production chief at the Mercedes-Benz luxury-car division, is leaving the company "for personal reasons" with immediate effect, Daimler said in a statement on Tuesday. He will be replaced by Markus Schaefer, head of production planning at Mercedes passenger cars who used to run the carmaker's U.S. plant in Vance, Alabama, and has more than 20 years of experience in car assembly, Daimler said. Renschler's departure, which the automaker said was by "mutual consent" and "unanimously" approved by the supervisory board, comes at a sensitive time for the German automaker. Mercedes is in the midst of ramping up production of the revamped C class, its best-selling model. The car will be produced in four factories globally, including the Alabama plant for the first time. "I very much regret that he [Renschler] is leaving the company for personal reasons," Zetsche said, noting Renschler's contribution to last year's launch of the Mercedes S-class flagship sedan. Zetsche said Schaefer, 48, has excellent qualifications for his new post because of his "broad knowledge of our production business and international experience gathered from his positions in the United States." A company spokesman said Renschler, 55, left for purely personal reasons, ruling out that possible dissent on policies within the management board or health-related matters played any role. The Stuttgarter Zeitung reported that Renschler may join Volkswagen to oversee its trucks business, which includes Sweden's Scania and Munich-based MAN. VW spokesman Michael Brendel declined to comment. Renschler oversaw the world's largest truck business for almost nine years, managing the division's investments in emerging markets such as Russia and India. He became Mercedes production chief last April. He had pledged to carry on with the efficiency program initiated by his predecessor, Wolfgang Bernhard. His work at the Mercedes car unit, which Zetsche leads, involved implementing efficiency measures at a division with a goal of cutting 2 billion euros in spending in 2014. Zetsche said this month that the automaker would meet that target early and might even exceed it. "The latest move means Zetsche's position is uncontested," a Daimler staffer, who declined to be named, said on Tuesday. The issue of succession at Daimler won't become acute until closer to 2016, when Zetsche's contract expires. "With Renschler gone, there's one candidate less to succeed Zetsche as CEO," said Frank Schwope, a Hanover, Germany-based analyst with NordLB. "Bernhard is not the only remaining option. Bernhard has not always been uncontroversial and there's the powerful bloc of employee representative to consider." Daimler narrowed a sales gap with German premium-car rivals BMW and Audi last year because of strong demand for its growing lineup of compact vehicles such as the A class and CLA. The Stuttgart-based manufacturer dropped to third place in the luxury-sales race behind Audi in 2011. Mercedes lost the No. 1 slot to BMW in 2005.